ALLEGRA BOVERMAN/Staff photo. Gloucester Daily Times. 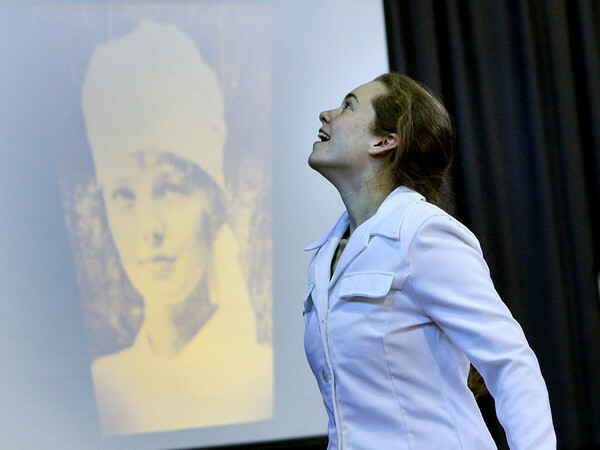 Gloucester: During a "Historical Perspectives for Children" program held at Beeman Elementary School on Friday afternoon, the story of Amelia Earhart was performed, from her childhood until her flight around the world. She is depicted here when she was a nurse's aide, admiring the planes that would fly over. January 7 is Aviation Day, January 11 is Amelia Earhart Day. This performance is part of the school's enrichment program.